How do I integrate with SugarCRM? Integrate with SugarCRM to sync data and visualize it in SalesScreen. Note: You need admin privileges in both SalesScreen and SugarCRM to carry out this approach. There are two prerequisites for integrating SalesScreen with SugarCRM. The first one is that you need to have a SalesScreen Pro or Enterprise subscription, and the second is that you need to have a SugarCRM online subscription. In other words, SalesScreen does not support integration with SugarCRM on-premise solutions. The integration is authorized through the OAuth2 protocol. This means that you authorize SalesScreen to retrieve data from SugarCRM on your organization's behalf. 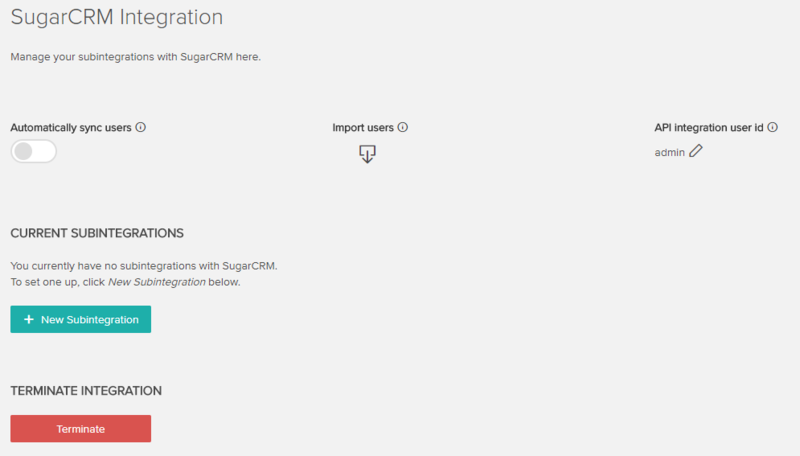 You need to configure some settings in your SugarCRM org before initialising the integration from your SalesScreen account. As an administrator, sign in to your SugarCRM org. The SalesScreen client can utilize several different IP addresses in the course of a session. This can complicate the authorization process, resulting in SalesScreen being denied when requesting data from SugarCRM. To make sure this issue won't arise in the context of the integration, we recommend that you turn IP validation off in the administration dashboard. Navigate to Administration > System Settings. Find the Validate user IP address setting and disable it. Finally click Save. By default, SugarCRM will prevent REST API access from unknown platform types – like SalesScreen. You therefore need to allow SalesScreen access by adding it as an API platform. Navigate to Administration > Configure API Platforms. Input salesscreen in the text field at the bottom of the list and click Add. You'll notice that the value will become present in the list. Finally, click Save. 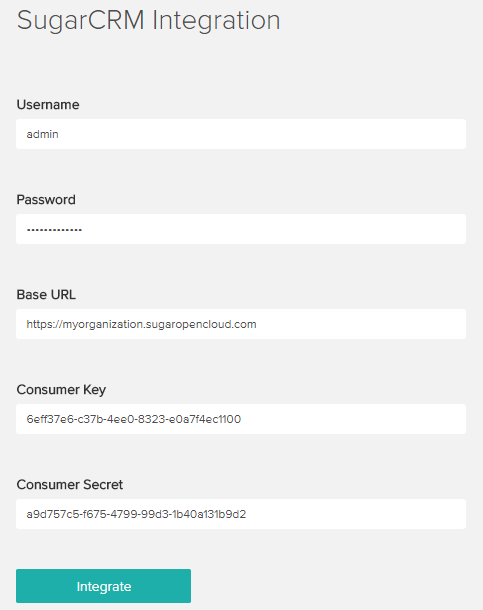 You copy the https://myorganization.sugaropencloud.com part. This is referred to as the base URL. 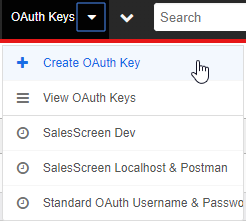 Click on OAuth Keys under the System section. Once there, create a new OAuth key by clicking on Create OAuth Key. In the creation view, there are several fields you need to fill out. The Consumer Key Name field should be filled out with "SalesScreen". The Consumer Key field should be filled out with a series of random numbers and letters. The best way to do this is to use a GUID generator. The Consumer Secret field should be filled out with a series of random numbers and letters, just like the Consumer Key. Note that the values need to be different. The OAuth Version dropdown field should be set to OAuth 2.0. The Client Type dropdown field should be set to Sugar User. Copy or note down the Consumer Key and Consumer Secret values. Finally, click the Save button to complete the creation of the SalesScreen key. To initialize the integration between the two systems, simply sign in to SalesScreen with an admin user account. Navigate to Company Settings by clicking Manage > Settings. If you don't see a the Manage button at the bottom left of the screen, it means you're signed in with a non-admin user account. 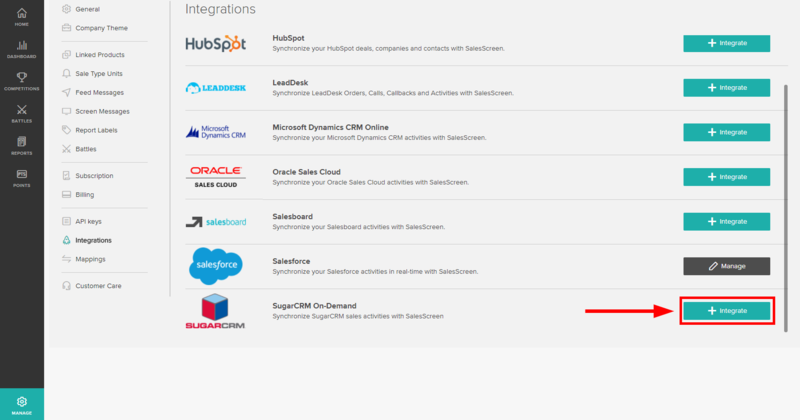 Once there, go to Integrations and proceed to click on Integrate for SugarCRM. You will be prompted to enter 5 values in order to initiate the integration. The base URL, Consumer Key and Consumer Secret are the same values you found and defined in your SugarCRM org. At no point will SalesScreen store your password. It is simply used by the OAuth2.0 protocol to execute the authorization process. When all fields are filled out, click Integrate. If everything's done correctly, you should be taken to the SugarCRM integration management dashboard after a few seconds. From now on, you can navigate to the integration management dashboard (Manage > Settings > Integrations > Manage SugarCRM) to pause/resume or terminate the integration. Create subintegrations to decide what SugarCRM data should be synchronized to SalesScreen.